Reproduction Denarius of Caesar coin supplied on a pin with clasp. 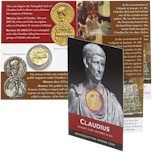 The information on the reverse of the card explains how coins were used to communicate, about Roman houses and about Minerva. A miniature of a Roman centurion's helmet supplied in a clear acetate box with information card that explains in detail more information about the helmet. A reproduction Denarius coin with the bare head of Augustus on the obverse and Capricorn with a cornucopia and globe on the reverse. A reproduction Denarius of Caesar coin with an Elephant trampling a serpent on the obverse and simpulum, sprinkler, axe and priests hat on the reverse. A reproduction Denarius with laureate bust of Claudius on the obverse and winged Nemesis and snake on the reverse.